When I was growing up I made a vow. I wanted to be an artist and I had no idea on how to accomplish that. Nobody in my high school had much of an idea either, so I determined that if I ever found out how to be one, and anyone asked me to come speak on the subject, I would return to reveal to them everything I have learned. Earlier this year, I met the Mohave County Community College Art Instructor, Ann King, at a "66 Kid" book signing at the Powerhouse Museum and she asked if I would come speak to her kids. 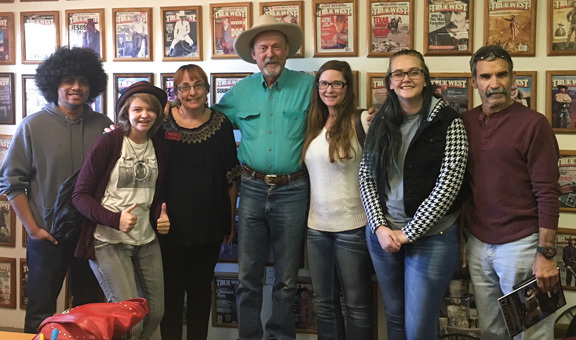 Last Friday these Kingman area student artists came by the True West World Headquarters for a little more art inspiration. L to R: Marlon Atibagos, Carly Sitton, Ann King (the teacher), BBB, Aliison Quintana, Kylie Bumgarner, and Fred Graham. I asked each of them to send me a photo of themselves in five years. Let's see how many follow thru. This time I asked each of them where they would be in five years. Some kind of knew, but most were quite vague about it. I told them they needed to be very specific. Those are good kids and every one of them has talent AND they have a dedicated teacher, which is wonderful (I didn't have that). I am serious about each of them nurturing a very specific image of where they will be in five years. I am challenging each of them to send me a photo of themselves with the information about what they are doing, and where they are. I don't mean this as some kind of accomplishment bragging, or expectation of success. I just want them to project out their creativity towards a goal. Wherever they end up will most likely be fine and the sooner they visualize this, the more likely they will achieve their goals. Good luck to all of them. I am expecting big things. "As for me, except for an occasional heart attack, I feel as young as I ever did."